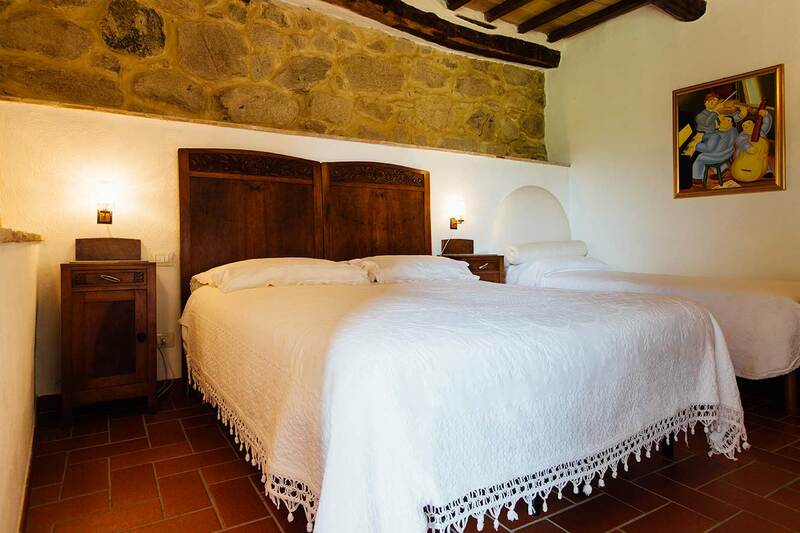 Cosy Tuscan villa rental within walking distance from a medieval village. easy day-trips to Pienza, Montalcino, Siena and thermal baths. 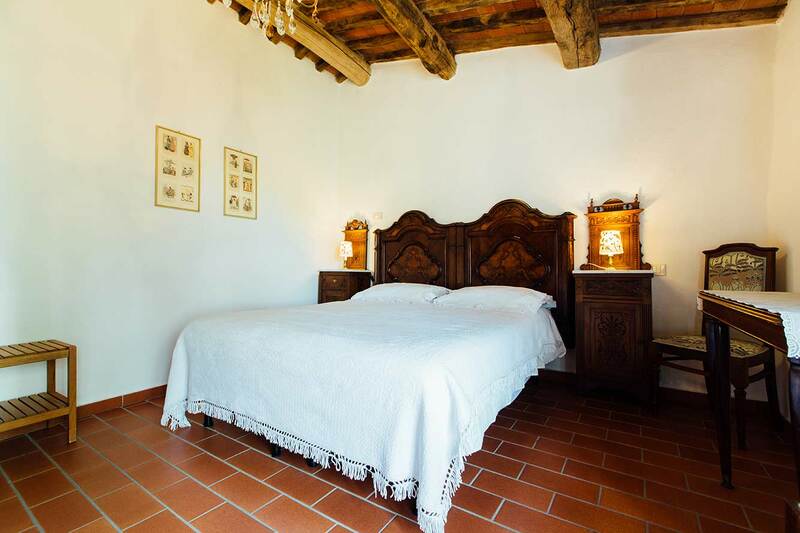 Santa Fiore is a typical Tuscan farmhouse built in the 15th century and recently restored to become a lovely Tuscan villa rental. 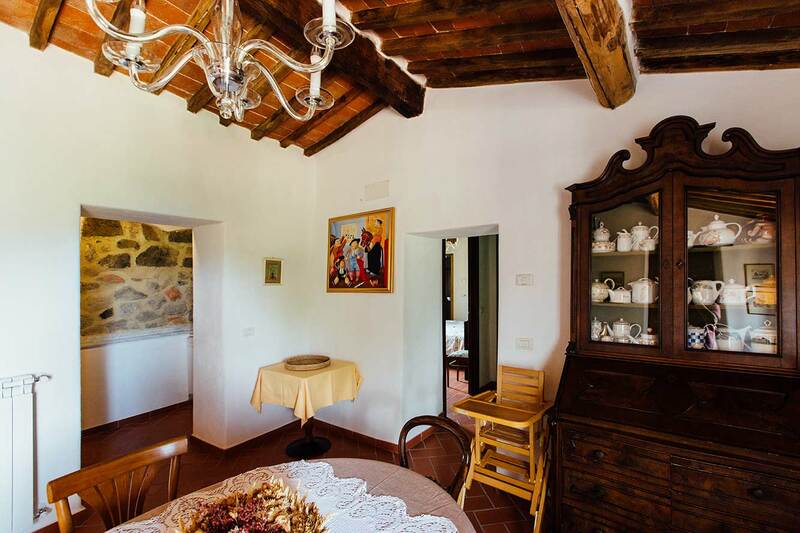 The original architecture has been preserved, and all details have been taken care of to respect the traditional Tuscan style. 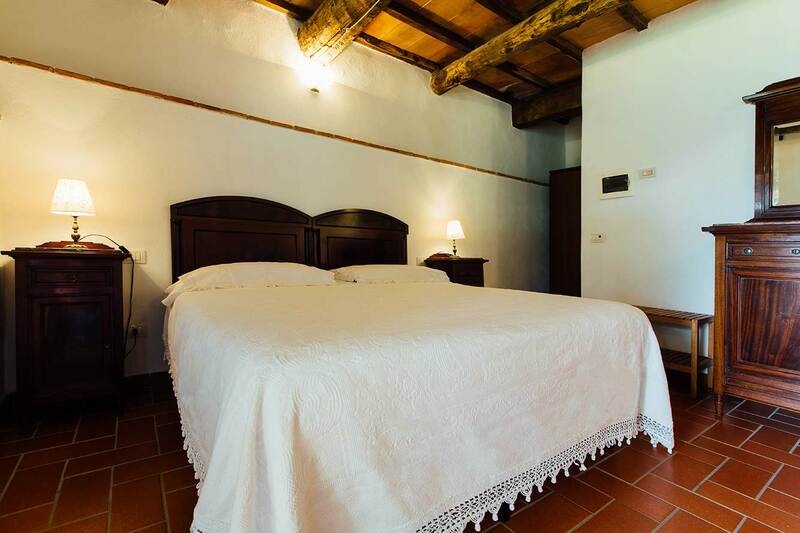 The location is absolutely quiet and beautiful, the views of green hills and olive groves of MONTE AMIATA (south of Siena) are simply stunning. 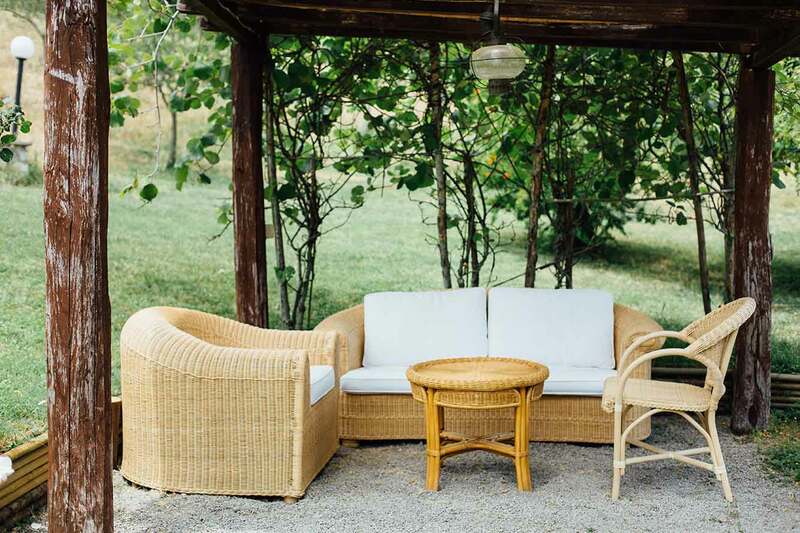 The grounds around the villa are spacious, with lots of space for kids to run and adults to sunbath, chat, relax and eat outdoors. Besides the covered terrace equipped with table and chairs offers a comfortable spot for eating al fresco. 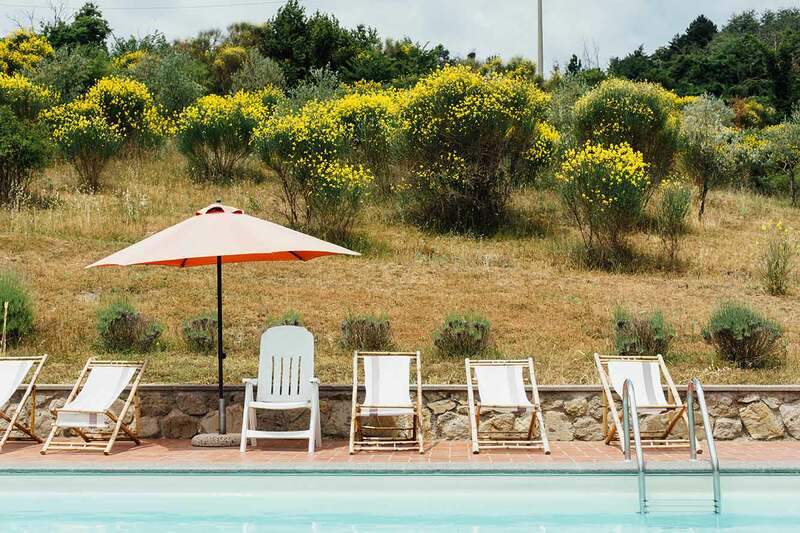 The private swimming pool, located only a few meters in front of the villa, is large enough for the whole group, with a deck equipped with reclining chairs and umbrellas, a great area for sunbathing and relaxing by the pool. The villa is composed of two levels. From the covered terrace is possible to enter directly two bedrooms. There is an external staircase that leads to the open terrace in the back, from where it is possible to enter the main room, kitchen and the other bedrooms. On the ground floor there are two bedrooms with en-suite bathrooms. Both bedrooms can be accessed directly from the covered terrace. One bedroom is furnished with a queen sized double bed and a single bed for one extra person. Ideal for a couple with a kid. The en-suite bathroom is fully equipped with shower box, sink, WC and mirror. The second bedroom is furnished with a queen sized double bed. 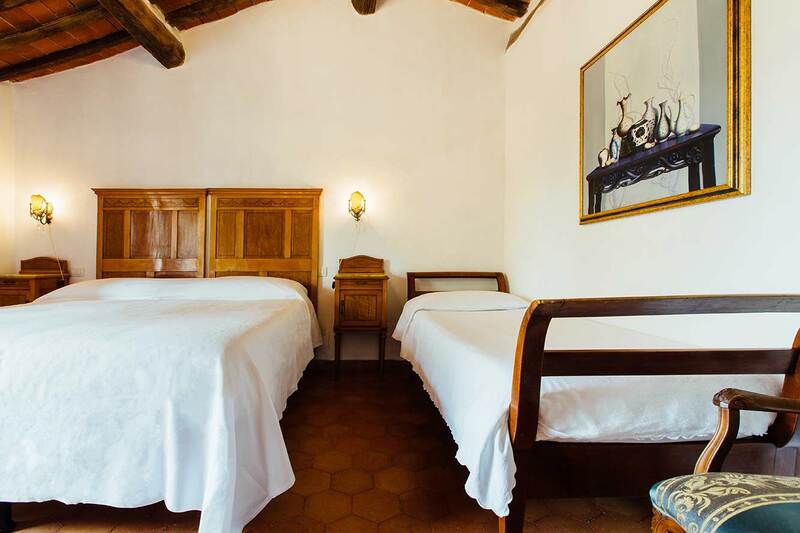 The bedrooms preserve the original “terracotta” ceilings with wooden beams and fire bricked floors. The furniture is also made of original pieces of antique beds, dressers, chairs and armchairs. All bathrooms are brand new, recently built each one en-suite. The furniture is modern, with glass shower boxes and new equipments like sink, WC and bidet. On the first floor are located the other 4 bedrooms, each one with its own bathroom too. The largest bedroom has a queen sized bed plus a single bed and an extra bed in case you have one or two children. One bedroom is furnished with a wooden double bed and a chaise-longue that can be converted into a single bed. On the first floor, with direct entrance from the open terrace, you reach the living room, with dining area, with SAT TV, sofas, armchairs and many seats, with 3 tables. The living room gives access to the fully equipped kitchen and the rest of the bedrooms. There is also a washing machine (5.- EUR each incl. washing powder). The two remaining bedrooms have a queen size double bed each. One of them is made of two single beds joined together, so they can be split to make a twin bedroom. 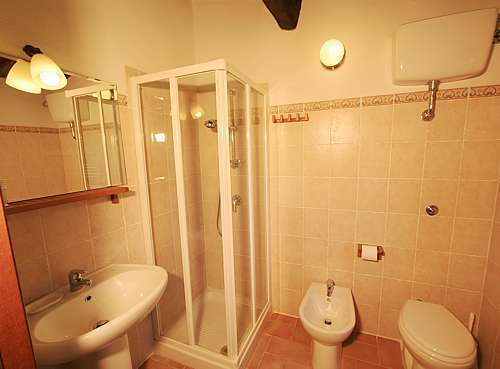 Both have their own en-suite full bathrooms, all with brand new equipments and shower box. 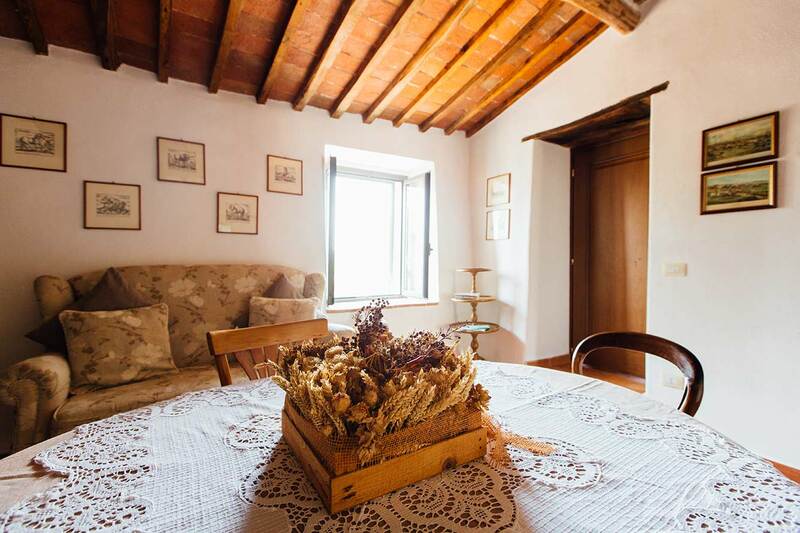 The villa stays within walking distance from a delicious historic village, in the area of Arcidosso, close to the Monte Amiata (a famous mountain that marks the Southern Tuscany’s landscape). The village has mini markets, cafes and two great restaurants. The owner organizes an International Music Festival that takes place every year in town, during the months of July and August. The event is sponsored by the regional government of Tuscany and many important partners. There are many concerts of all styles of music played by international awarded musicians. SANTA FIORE is also an ideal place to get married. 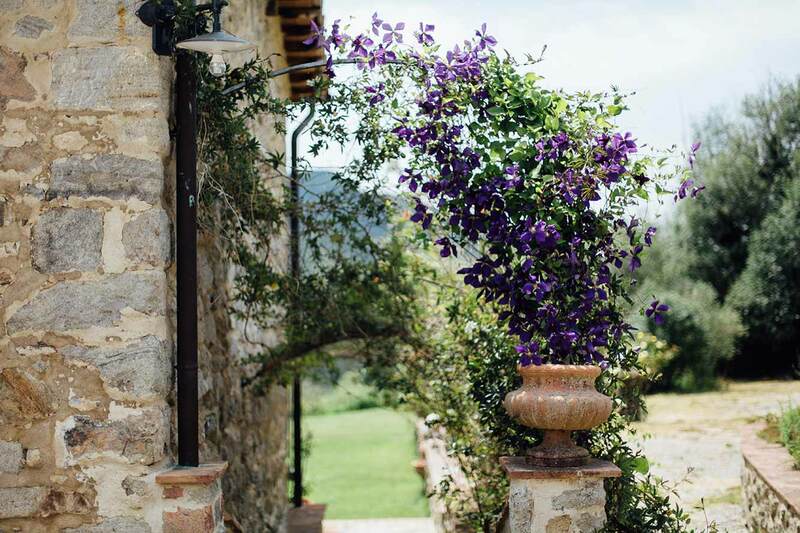 The church of the nearby medieval village is in walking distance and the owners are pleased to help you to organise a wedding ceremony at the villa. From Santa Fiore is very easy to make funny day-trips to important sites like Siena, Pienza, Montalcino, Montepulciano and many thermal baths, among them Petriolo and Bagno Vignoni. The sandy beaches of the Tuscan coast you reach within about 1,5 hours drive. We've spent a splendid vacation in this holiday house. 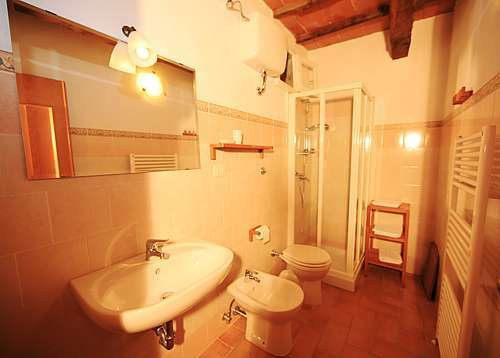 The house is located in the country side and yet only 10 minutes walking to the city centre of Santa Fiora. Bedrooms are spacious and clean. Each bedroom has its own bathroom with shower and toilet!! The living room is rather small but there is a large terrace where you can sit and relax throughout the day. 3 bedrooms are connected to the living room, the other 2 bedrooms are connected through an outside door. Also the kitchen is connected through an outside door. It contains all you need during holidays. The pool is cleaned every day and situated about 20 meters away from the house. The owners are living next to the holiday house and are extremely discreet but also very helpful and attentive in case needed. They will recommend the best places to eat, shop and visit. Santa Fiora itself is a small city, but has a supermarket, butcher, bakery, tourist office, bank,... really everything you'd need. During our stay there was a music festival with performances in different locations in the city as well as other festivities.